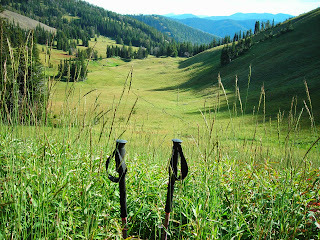 I haven't mixed it up much lately, but did squeeze in a favorite hike up Coal Creek with Joanne and Bridger last week. Weather was absolutely perfect, allowing for short sleeves even on the return downhill. This photo is looking west from the flanks of Mesquite Divide, down into Coal Creek meadows. It's a scenic little valley that is always remarkably quiet on summer evenings, and would be a great camping spot. I keep waiting to see a good herd of elk, I know they're around. From the divide, the view of Moose Meadows and the Tetons to the north is simply breathtaking. I've crested that ridgeline dozens of times over the years, and it never fails to wow. Feels like a piece of Switzerland and Alaska, right here in our Driggs, Idaho backyard. We can power-hike there from the trailhead in an hour flat, or take a more leisurely view-centric 90-minutes with friends. It's been a ridiculously busy past few weeks, with lots of business travel, but I've managed to stick to my bike training rides wherever I've gone: Pocatello, Ketchum, Logan, Toronto, Salt Lake, Park City, Dubois. I've probably logged more bike miles outside of Teton Valley than within this summer, but it's kept things fresh and lends the sense of adventure that I love. 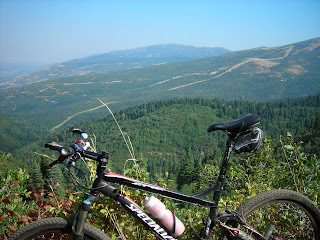 This photo is from the upper Mueller Park-North Canyon loop east of Bountiful, Utah...my old stomping grounds. LOTOJA is only two days away. I'm ready to endure whatever profound suffering is necessary, and git 'er done! 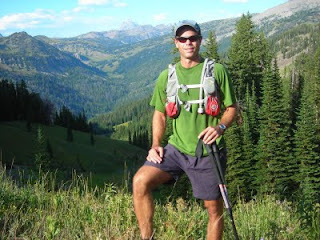 Hi - I just found your blog searching for info about Driggs - maybe Victor. I have a young family (from Utah)and we are looking at relocating to Driggs. We have looked at lots, enjoyed all the outdoor recreation, but really need info about the schools and activities for the kids? Can you direct us to that info? What's going on in Driggs? We're back in FL, and waiting and waiting for a snow report?? We've got the frost, but no snow. Please, some pictures and info about Teton County. We miss you!